8½ x 11 inches - 42 pages. Each activity features a corresponding illustration at the head of each page. 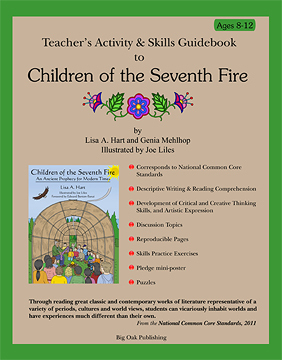 I have developed this Teacher’s Guidebook to be used along with Children of the Seventh Fire. It is best to have your students read the entire story all the way through, then select the activity you are interested in, from the subject categories listed in the Index. In the Index listing, I have given other information about the activity, such as: approximate length of time it takes to complete, the average grade it’s appropriate for, what type of activity it is, for example: reading, writing, artistic or discussion exercise, and which National Common Core Standard it corresponds to. I hope this information is helpful. If you can think of another, more helpful way to categorize this information, please let me know. I am always seeking to improve this teaching tool. You will find thought provoking discussion and writing prompts that directly address some of the more important issues in these times of social and environmental change. They will challenge students to be creative, solution-oriented, cooperative and respectful in their methodology. Most importantly, have fun with it! I feel that the best learning takes place when children are involved with a meaningful, fun and creative project. Speaking of which, remember that the kids can have their projects posted on this web site! Get those projects going and send us the descriptions and photos, so we can post them!